Liberal education is the ordinary process by which ladies and gentlemen are formed. Without it one will always remain a barbarian. Now if you are a barbarian please don’t take this as a put down. I am proud to count barbarians among some of my closest friends! Except when they are tearing down civilization and overrunning cities, Barbarians can be very decent people. Sometimes even when sacking a city barbarians can act in a civil manner. Take Alaric, King of the Visigoths, for instance… now here was a first-rate barbarian. Besieging Rome twice he finally sacked the city in 410. He only burnt a few of the buildings and supposedly the inhabitants were treated humanely. And this is difficult to do! How does one go about sacking an enormous city without at least a token of some plundering and pillaging? I mean even barbarians do have appearances to keep! Then, of course, you have a barbarian like Attila the Hun. What a stand up guy! Pope Leo the Great was able to convince him to withdraw from Italy (don’t ask me how?) probably through some discussion and perhaps a shared prayer or two. I doubt they held hands, but Attila must have had something more than a little respect for the chair of St. Peter, which is a great deal more than what some of our current barbarian world leaders have. So without condoning barbarians qua barbarians, I am just trying to cite a couple of examples of some extraordinary barbarians who though not famous for their liberal educations still managed to turn out as fairly decent chaps! Frankly, I expect to meet many barbarians in purgatory where they will all finally be liberally educated for about twelve years, while I am punished for thousands because of my bottomless pride! But as I said above the only natural way to avoid being a barbarian is through liberal education. 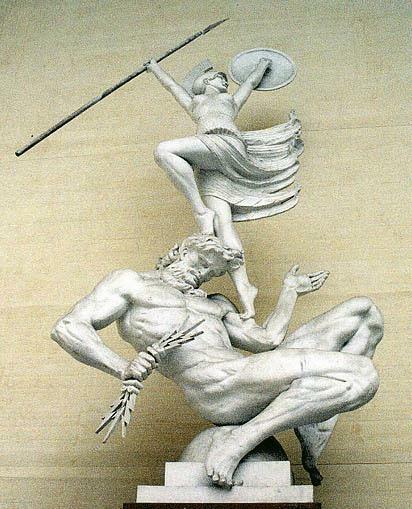 Now, I suppose God might simply sidestep the whole lengthy process of liberal education from time to time and simply transform someone into a full-blown gentleman or lady in a flash – sort of like Athena springing forth from the head of Zeus. Occasionally one hears that this or that saint was able to sidestep the rigorous training in Grammar, Rhetoric and Logic that the rest of us have to undergo to become proficient and eloquent speakers, because God Himself has some special time sensitive mission to accomplish. For example, whereas the great Greek orator Demosthenes had apparently taken great pains to overcome his speech impediments, Moses appears to have taken a shortcut. I think this passage may give some students unrealistic expectations. We should be very careful to point out that it would be presumptuous for most of us to count on this kind of Divine intervention. So the point remains – and I suppose we ought to recap and “tie things up” here, that although here and there we find a decent barbarian, and again, although we might from time to time find some saint who appears to have skipped the normal educational process, nonetheless everyone ought to do what they can to be liberally educated. This entry was posted in classical education and tagged Alaric, Attila the Hun, Barbarian, liberal education, Pope Leo the Great. Bookmark the permalink. So I take it you normally have converse with non-bearded city-dwelling men who are fluent in Greek? Who are these other barbarian friends of yours who, according to Cassiodorus, “do not live in cities, making their abodes in the fields like wild animals” or πᾶς μὴ Ἕλλην βάρβαρος – do not speak the Greek language – or are the “barbaros” – the bearded ones? I shudder to think that you have such creatures over to your house for dinner. Also, I understand the Lyceum has a city-dwelling Greek teacher, but he has a beard? Help me sort out this confusion (in English, please). I love the Cassiodorus quote. But I guess I will have to say that the similarity between βάρβαρος and “barba, ae” in Latin must be purely coincidental- although I do not have my Greek lexicon out to look up the Greek word for beard. Nonetheless I will grant you that bearded people do appear – at least on the face of it 🙂 uncultured in the original sense of the word (cultus, us). But I realize that this appearance is purely superficial- especially in view of the very civilized bearded Greek teacher at The Lyceum! Perhaps the equivalent (of a beard in the Greek world) in modern times would be men with very long hair or women with very short hair or people who dye their hair unnatural colors.